They took away the house! 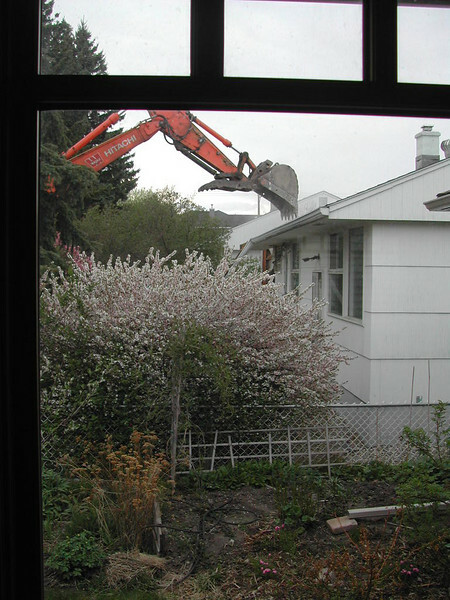 I came home from work one evening to find a machine eating the house next door. By the next afternoon, nothing was left but a hole. They are supposedly leaving one of the large spruce trees, but the other is gone, along with several lovely large cherry bushes. In the meantime, the neighbours are gathering around the hole to talk about it all! Wouldn't it be nice if there were to be a park or a garden instead of a double house there!